IN 1798 something remarkable happened in Ireland. Irish Catholics and Presbyterians put aside religious differences to unite in common cause over their grievances against British rule and its discriminations against them. Between May and October that year, they fought to establish an Irish Republic. This year marks the 220th anniversary of the rebellion - which began on May 24 1798. However, given it was widely marked for its bicentennial in 1998 and that the State is currently in the middle of the 'decade of centenaries’ charting the events of 1912 to 1922, 1798 is likely to be overshadowed. Yet, Paddy Cullivan - satirist, commentator, performer, and leader of The Late Late Show house band The Camembert Quartet - believes 1798 and the United Irishmen's ideals must not be forgotten, but instead need fresh examination, precisely because they are more relevant now than ever. 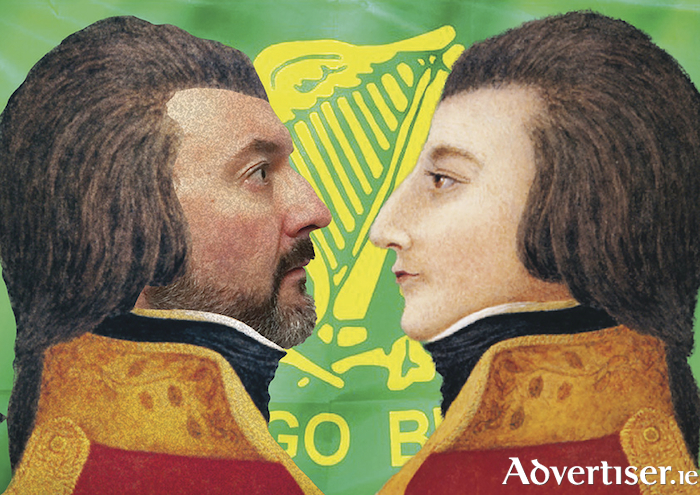 Paddy will present his new show, The 10 Dark Secrets Of 1798, in the Town Hall Theatre on Tuesday May 15 at 8pm. He describes it as “a live documentary with four songs topping and tailing both halves" and "300 images" telling the story chronologically. "It is a bit like The Late Late Show in that it starts out hopefully, goes on way too long, and in the end you feel depressed," he says, "but at least you'll be informed!" Paddy, who was born in Galway, credits his passion for history, and for 1798, to his father, the classical composer and pianist, Tom Cullivan. "In 1982 we moved into a Georgian house on North Great Georges Street, dating from the boom period before the 1798 Rebellion," he says. "Luke Gardiner, who developed Dublin's northside was killed in New Ross in 1798, and my dad also did a show on 1798 called 'Myles Byrne Remembers'." The 10 Dark Secrets Of 1798 follows Paddy's successful and provocative The 10 Dark Secrets Of 1916, which challenged official and traditional narratives and analyses of Ireland’s path to Independence. Audiences can expect the same passion for history, and historical rigour and investigation, as was on display there. “The reaction to the 1916 show was amazing,” Paddy tells me, “in part I think because there is so little history discussed in Ireland, and it unfolded like a thriller. People were astounded at some of the facts beyond the official narrative as I think they will be with the new show. The Dark Secrets format fits because there is so much that is unknown to the populace in general about these seismic events. So what are audiences likely to learn from this show? The first is that Wolfe Tone’s suicide may have been no such thing. Generations of schoolchildren have been taught that, after the rebellion’s failure and Tone’s capture, he slit his throat while in prison to deprive the British of the pleasure of executing him themselves. One of the most astounding things of 1798 is that Irish Republicanism was birthed by Irish Protestants and that Ulster Protestants were so prominently involved. Yet, within a few years, this radicalism was extinguished, and replaced by loyalty to the British crown. Yet despite the “bloodshed, overblown sectarianism, and economic fallout”, Paddy argues passionately that the rebellion’s ideals, and Wolfe Tone in particular (“Tone confounds every expectation - he's supposed to be a loyal Protestant yet travels the world trying to end his own kind's ascendancy. He should protect his own interests but wants equality for everyone.” ), remain relevant, inspiring, and deeply challenging to contemporary political attitudes and structures, not to mention the oncoming impact of Brexit. “We now live as citizens, not subjects, in a flawed and incomplete Republic because of the ideas of the men and women of 1798,” says Paddy. “The viciousness of the British government’s response is the greatest legacy though - and often why in these times of diplomatic relations with Britain, we tend to forget the horribly creative levels of violence used on over 30,000 people. It led to the Act of Union, a union that is now shattered because of Brexit, and makes one wonder if the United Irishmen had it right all along, because Unionists now have a hard choice - a new future or a hard border. "We are on the cusp of a United Ireland, bizarrely sooner than we imagined because of the Brexit debacle. We are closer to the dream of the United Irishmen coming true than ever before, yet this amazing story of republicans of all backgrounds coming together is being ignored, as expected. As with 1916, the story of a collective effort by people of all creeds and classes needs to be told. "Establishments are, by their nature, hierarchies, something a republic should seek to abolish. The church, academic, and political classes cannot bear these egalitarian rebellions because it threatens their very existence. That's why there is a constant attempt to reduce these things to immoral violent outbursts when the everyday violence of these hierarchies on the people is far more insidious and controlling. World War I took far more lives than the 1798 and 1916 rebellions combined - but it is an official and therefore 'just' blood sacrifice. People are getting sick of it though and can see through the crass attempts to belittle the sacrifices made through our history. Tickets are available via the Town Hall Theatre (091 - 569777, www.tht.ie ).